This new Drum and Bass sample pack has been meticulously prepared and covers a broad range of audio samples, including drum loops, syncopations, deep bass lines, synth loops, atmospheric sounds, sound effects and looped synth pads recorded at 160 bpm. This new sound library comes with free usage rights and is sure to get your creative juices flowing for original Drum n Bass compositions, jingles and soundtracks. 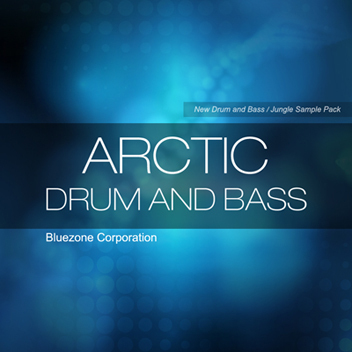 After the release of Austral Drum and Bass, Bluezone Corporation adds to its extensive percussion range with this new resource-packed collection: Arctic Drum and Bass. Easy to use and adapt, the 126 loops and samples contained in this set have been worked to provide the highest quality, not just in musical ideas and themes but also in the stereo spread. Recorded at 160 bpm, the rhythms will provide solid foundations for your compositions. Arctic Drum and Bass gives you tons of tight kicks, hi-hats, rides and snares, synth loops ranging from calm to high-octane, as well as loads of rich atmospheric sounds. Backed with complex and varied sound effects, this pack’s warm sounds will be a perfect addition to your library. Suitable for style such as: DNB, Breaks, Dubstep, music for video games, TV series, Soundtrack, Hardstyle, Experimental and more. This entry was posted in Sounds and tagged Bluezone Corporation, Drum and Bass, Library, Loops, Samples, Sounds. Bookmark the permalink.